This week, by far, has been the worst week for me since the beginning of the year. I missed my school bus TWICE this week and 'cause I live quite far from school, transportation is a big matter for me and I have to wait all the way to 7pm to make it to the next ride home. And today because of En Phang's retirement day, we all had to be released a bit later from the usual time. A bit later means I will miss my bus and that was exactly what happened today. And to add another 'sadness' into my week, my RM 5 was stolen by I-dont-know-who during recess. MFB!!!! I know RM 5 is like nothing but I hate it when I lose my stuff unnecessarily. I don't know why but I sweat about all these minute issues. Then again, I'm a kinda person who has to have everything work out perfectly everyday. Kamera sapa tu? Kodak lama ke? I thought it wasn't working well? Sorry to hear of your misfortunes but it's a PIG year this year. Mine has its ups and downs too. On my way to Arkansas, I had to wait 3 hours for my flight in Syracuse, another 4 hours in Chicago. All due to bad weather.So they told us. Will update my blog on the Arkansan trip when I get back. 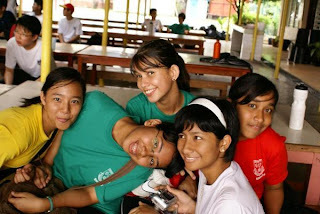 and the merentas desa pic wasnt the kodak cam. I remember missing my school bus when I was in Standard 1 and that was in decades ago. I missed the bus because the driver missed not missing me. Luckily for me, my parents' friend's son managed to get me onto another bus. To cut a long story short, I had to spend the night at my parents' friend's house - complete strangers to me. It was awkward, it was awful, it was simple the most uncomfortable night for me. At least you didn't have to sleep at complete strangers' house when you missed your bus!!!! !